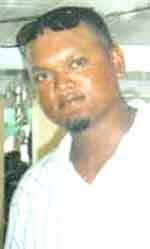 Almost nine years after boat captain, Ganesh Roopnarine fell overboard and died when another vessel slammed into his, an inquest to determine if anyone should be held criminally liable is scheduled to commence next Friday before Magistrate Esther Sam at the Suddie Magistrates’ Court. Those expected to testify are Mohamed Khan of Goed Success, Wakenaam Island; Rampaul Drepaul of Lot 16 East Meter Meer Zorg, West Coast Demerara; Ryan Chandler of Lot 39 Parika, East Bank Essequibo; Namdeam Chatergoon of Goed Hope, Essequibo Coast and Jagdeo Looknaught of Lot 33 Wales, West Bank Demerara. The others are Pulmattie Persaud of Lot 5 Bensford, Wakenaam Island; Kamala Lekram of Lot 83 half San Souci, Wakenaam; Balram Salik of Marisa’s Pleasure, Wakenaam; Christine Ayub of Parika, East Bank Essequibo; Denise Wolfe of Aurora Police Station; Detective Corporal Hamechand Singh and Detective Corporal Terry Beharry both of Suddie Police Station and Lakeram Deochand of Anna Regina Police Station. On June 14, 2013, Ganesh, 32, formerly of Barnwell, West Coast Demerara was reportedly repairing his boat engine when he was hurled overboard after another vessel rammed his. According to reports, Roopnarine had loaded his vessel, ‘Water Girl,’ from the Supenaam Stelling. However, when the vessel was some 500 yards from the stelling, it developed engine trouble. Roopnarine was reportedly trying to fix his engine when another boat, named ‘Wakenaam,’ slammed into his. It was reported that the boat’s bow struck Roopnarine and he was hurled into the water. Reports suggest that the pilot who crashed into Roopnarine’s vessel tried to flee after the mishap, but was captured. Roopnarine, on the other hand, died on his way to the Suddie Hospital.